The Minitiouner hardware is designed for easy home construction, uses only leaded components and consists of the 3 main components. To build the unit you only need to buy the following components from the BATC shop [] and then download the free MiniTioune software. The unit uses an adjustable MCP1826 as the 1v regulator, which can be hard to find. All other components such as Rs, Cs and 5v buck regulator are available from normal suppliers - see the parts list further down this page. 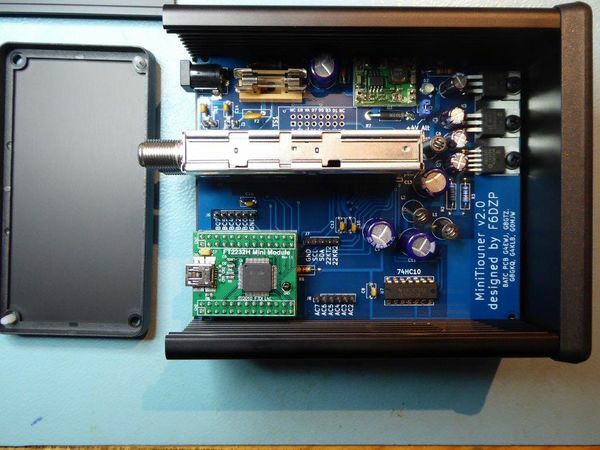 The PCB has been developed to fit snuggly inside a Hammond 1455 series 103x120x53mm enclosure and uses standard leaded components so no specialist techniques needed. Note the 22uF electrolytic capacitors on the regulators are low ESR types chosen to minimise oscillation - substitute at your peril! Ceramics can be used instead but through hole 22uF ceramics are expensive. The small regulator module is used to reduce the 12v input down to 5v to reduce power dissipation in the linear regulators. The recommended type is available from ebay - search for "MP1584 step down buck regulator". 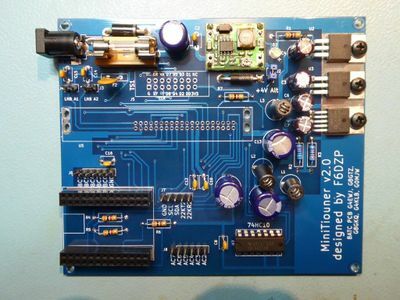 The design uses a MP1584 buck converter step down module to reduce the input, which can be in the range 6-20V down to 4V. Using a switching converter significantly reduces the generated heat. Optionally a 3.7-5.5V supply can be used instead, bypassing the converter Three low drop out linear voltage regulators are used to regulate the digital 3.3V and 1.2V and analogue 3.3V supply rails. Linear regulators and extensive filtering are used to ensure low noise for maximum RF performance. There is not much to set up but before connecting the DC-DC converter to the input of the linear regulators, the output MUST be set to 3.7-4v output. This is because these LDO regulators can only handle a maximum of 6V input. There is a zener to provide some protection but damage is still possible and worst case you could end up with whatever is on the input appearing at the output - i.e. 5.6V on the 3.3V and 1.2V rails. There are two options, one is to set the correct converter voltage before its installed on the PCB. The other is to remember not to fit the jumper JP2, ALT 4V that connects it to the regulators and set it up in commissioning. We recommend that you build and then test all the voltage rails BEFORE fitting the NIM. This is easy as you can probe the top of the RFCs to measure them. If you don't use the DC-DC converter and run directly off an external 5V (DO NOT connect a higher voltage) supply to JP2, you may need to heatsink the regulators. With the DC-DC converter, the copper area on the board seems to be adequate as a heatsink. Do not allow too much strain to be exerted on the USB socket - at least one has been known to dislodge during use. A small modification must be carried out before this version 2 hardware can be used with the MiniTiouner version 0.8 software (latest version released Spring 2018). 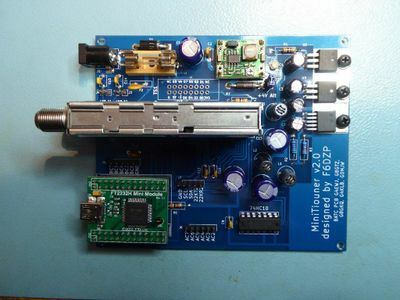 A resistor between 5.6k and 12K must be fitted between CN2 Pin 19 on the USB module (U6 on the BATC PCB) and ground as shown in the pictures by G7JTT and G1MEG. All USB modules sold by the BATC shop are ready programmed and you do NOT need to reprogram it..
Once you are satisfied the voltage levels are correct and there is no smoke, you need to run the MiniTioune software. Full details including how to set up the software, drivers and decoders is on the MiniTioune software page. 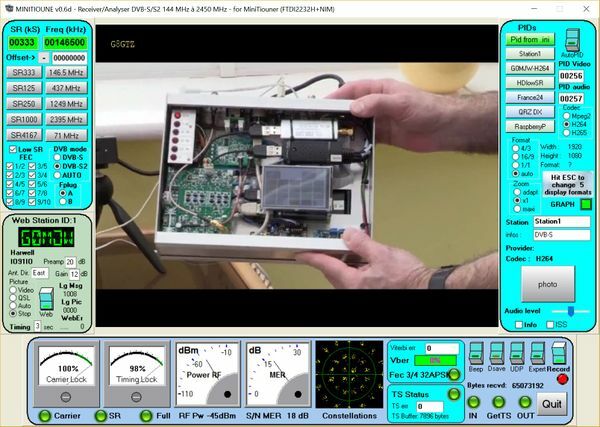 Apart from the the version 1 PCB with adaptor card, this version 2 PCB with Serit tuner is the only available solution to receive and decode DVB-S2 reduced bandwidth modes - this picture shows G0MJW receiving G8GTZ/P 1920*1080 HD pictures on 146 MHz using 32 APSK (approximately 1.3 mbit/s in 550 KHz bandwidth).